Promoting and protecting innovation, every step of the way. 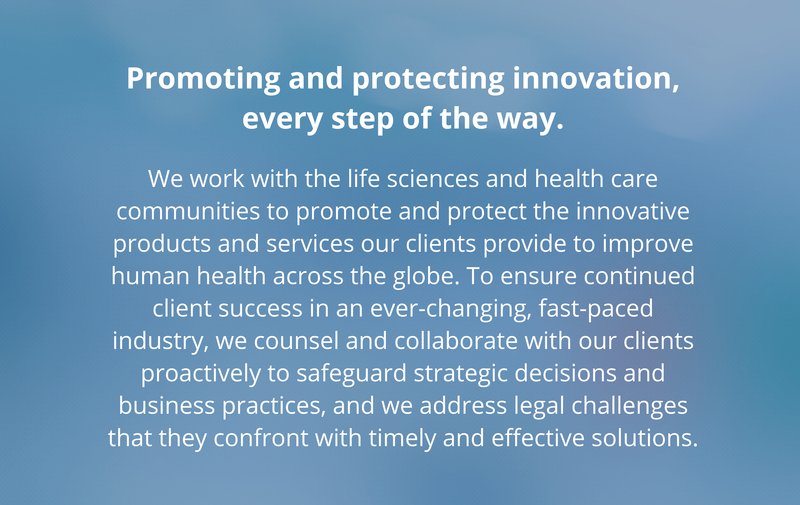 We work with the life sciences and health care communities to promote and protect the innovative products and services our clients provide to improve human health across the globe. To ensure continued client success in an ever-changing, fast-paced industry, we counsel and collaborate with our clients proactively to safeguard strategic decisions and business practices, and we address legal challenges that they confront with timely and effective solutions. We are lawyers dedicated to employing our deep knowledge and unique experience to support the needs of health care providers and life sciences clients. We understand the complex legal issues that surround health care delivery and the development and marketing of innovative products and services. Our lawyers have immersed themselves in the health care and life sciences industry and bring many years of experience to their practice. We bring energy, commitment, passion, and integrity to all that we do. We work “shoulder to shoulder” with our clients, striving to ensure first and foremost that our counsel is based on full understanding of our clients’ businesses. With this understanding, we apply our deep knowledge of legal and regulatory issues in health law and life sciences to assure our clients’ success. For a variety of health care providers, start-up biotechnology companies, and pharmaceutical and device manufacturers, both big and small, we provide specialized insight and counsel in a wide variety of service areas.